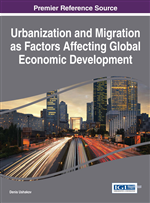 Fast-growing international migration as a factor of labor market globalization is an important trend of the world economy and a determinant of social-political transformations. The study of fundamental economical reasons for international migration is relevant due to their prognostic, predictable, and normative potential, which can be used in conditions of global economic non-stability. This chapter analyzes the role of natural resources, financial, and labor factors in economic growth of the modern states and studies relationships between stimulating the role of natural resources, finance, and labor with levels of modern countries' economy development. Based on achieved results findings about fundamental reasons of international migration, transformation of labor factor's role in providing an economical progress of the states, efficiency of positive impact of manufacturing factors (domestic and attracted from international markets) are offered. Economic growth in its narrow sense - is an interaction of exogenous and endogenous factors that are forming at the stage of manufacturing, gaining sustained character on the other stages of economic reproduction, and finally lead to quantitative and qualitative changes of the productive forces (resources, labor, technologies, capital and so on), to increasing of gross product and national welfare (Marx, 1986, pp. 46-49). In a broad sense: economic growth is a reflection of current economic and institutional conditions that determines a direction of social movement, establishes a nature of social development in general (progressive, regressive or slow). As an object of study economic growth has qualitative and quantitative determination; its substance is revealed through analysis of qualitative and quantitative characteristics. It’s necessary to clearly distinguish concepts of “economic growth” and “economic development “. Firstly, the development takes place even when there is no any growth. Secondly, development can be expressed in different structural changes, in various innovations that do not lead directly to economic growth. Thirdly, development can be carried out by declining trend, without quantitative growth and even with a decay of product or services properties. Being a result of social reproduction, economic growth is not only an attribute of manufacturing. Appeared at the stage of manufacturing economic growth passes through the stages of distribution and exchange and finally manifests in consumption. There is very complex relationship between production and consumption. Despite an importance of production, last one is useful only as supporting of consumption. So economic growth that was born in the depths of production process, finds a real essence and content only in the end of reproduction chain (when product is produced, sold and consumed). Economic growth as a complex phenomenon can be presented not only as a criterion of economic development, but also as a process with number of quantitative and qualitative economical and social indicators. Among them we can primarily note the indicators of absolute increasing of gross national and domestic product (GNP and GDP), national income (ND) and changes of these parameters in “per capita” terms. We can use both of these groups of indicators. For example, focusing on the problems of economic and political potential, it seems more appropriate to use first group of indicators. However, comparing living standards in different countries and regions, it seems more preferable to use second group. An economic growth analysis becomes really reasonable when it carries out in a historical retrospective, with a highlighting of different historical periods. These factors define particular types of economic growth.